A variety of professional workshops will take place during the Conference. These will combine research and science with experience, and will give experts and health practitioners the opportunity to learn more about their field of interest in Israel. These workshops will take place in leading medical, health, education and sports institutes and clinics, as well as in popular food markets, aromatic plants and herbs fields around the country. The workshops will deal with topics such as Mediterranean Nutrition: From the Field to the Plate; Special Nourishment; Parenteral and Enteral Nutrition. Special attention will be given to sports nutrition, with a workshop that will take place at the Wingate Institute – The National Institute for Sports. Participants will have the chance to meet leading sports medicine and science experts who work with the country’s elite athletes. The workshop will combine the most recent knowledge from the sports sciences as well as active engagement in physical activity. All the workshops will be conducted by local and world leading experts. 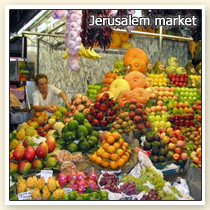 Don’t miss the opportunity to have first-hand experience of nutrition in Israel.